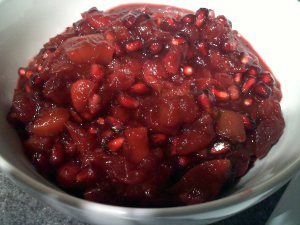 Cranberry sauce with apples, pomegranate, citrus and spices. The fruit that provides the base of this traditional side dish deserves to move from holidays to everyday. Cranberries are packed with dozens of different antioxidants. The natural mix of antioxidants found in cranberries and other foods is what matters, not the high doses of single ones found in supplements. If you make your own cranberry sauce from whole berries, you’ll get a tastier and less sugary sauce than you can get out of a can. Tip: If this is too tangy simply add more maple syrup or brown sugar to sweeten. Recipe created by : Dietitian Paola Garza.